…Larry Merculieff has almost four decades of experience serving his people, the Aleuts of the Pribilof Islands and other Alaska Native and indigenous peoples in a number of capacities locally, statewide, nationally and internationally. His reach has been broad and varied—a few of the positions he’s held include: City Manager of St. Paul Island, Commissioner of the Alaska Department of Commerce and Economic Development, President and CEO of Tanadgusix Corporation, Chairman of the Board of The Aleut Corporation, and General Manager of the Central Bering Sea Fishermen’s Association (one of the six Community Development Quota groups created by Congress to receive fish allocations in Alaska). Most importantly, Merculieff was a community leader on St. Paul Island, his home, for almost 35 years. Merculieff’s first opportunity to share what he learned came from an invitation to help facilitate a healing conference in Cordova in the late 1980s. He presented at the Healing from the Four Directions conference, facilitated the Healing from the Center conference in 2008 and conducted traditional talking circles at a substance abuse recovery center over the past two years. He also helped facilitate a statewide training for rural behavioral health aides in 2009. Additionally, he has and continues to lecture about traditional ways of healing at conferences and universities, including UAA. He presented at the first Anchorage conference on grieving to help parents who lost children. Merculieff also facilitated a community-wide grieving ceremony in Nondalton when their elders called him to assist because they were concerned that the community was not grieving the tragic loss of two local teenagers. Merculieff has presented numerous times at RANN, the UAA program for minority peoples seeking a degree in nursing, discussing traditional ways of knowing and healing, and the ways culture heals. Recently, Merculieff conducted a dialogue with youth in a program he created that was called Healing the Wounded Warrior. From 2000–2003, Merculieff served as the Director of the Department of Public Policy and Advocacy in the Rural Alaska Community Action Program. As Director, Merculieff co-chaired the planning committee and led the largest subsistence rights march in Alaska’s history. He emceed the subsistence rally after the march. The march was instrumental in protecting Alaska Native subsistence rights, which were legally contested by the State of Alaska, to fish for salmon along Alaska’s rivers. He also successfully led a four-year effort to gain federal and state recognition of Alaska Native subsistence rights to catch and eat halibut throughout coastal Alaska. Merculieff is co-founder and former chairman of the Alaska Indigenous Council on Marine Mammals; former chairman of the Nature Conservancy, Alaska chapter; former co-director of the Native American Fish and Wildlife Society, Alaska chapter; as well as co-founder of the International Bering Sea Forum, the Alaska Forum on the Environment, and the Alaska Oceans Network. He served as chairperson for the Alaska Sanitation Taskforce and co-chair of the Federal/State Taskforce on Rural Sanitation to bring support for running water and flush toilets to over one hundred Alaska Native communities. Merculieff served on the National Research Council Committee on the Bering Sea Ecosystem and was one of four Native Americans to present at the White House Conference on the Oceans during the Clinton administration. Merculieff was selected by Aleut leaders to be part of a one-hour Discovery Channel documentary about the history and spiritual aspects of Aleuts, which aired in 2001 and was viewed by an estimated 60 million people worldwide. 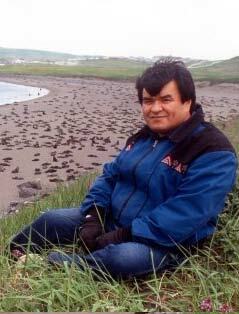 In 2004, Merculieff received the Alaska Native Writers on the Environment Award from the Alaska Conservation Foundation, the Rasmuson Foundation Award for Creative Nonfiction in 2006, the Buffet Finalist Award for Indigenous Leadership and the Alaska Forum on the Environment- Environmental Excellence Award for lifetime achievement in 2007. Merculieff was featured in the National Wildlife magazine as an “American Hero,” having called national and international attention to major adverse changes in the Bering Sea ecosystem. Merculieff’s writings and interviews have appeared in such publications as the Winds of Change, Cultural Survival, YES, Red Ink, Alaska Geographic, Smithsonian, National Geographic, and Kindred Spirits. In 2008, Merculieff was one of ten Native American men in the U.S. featured in a book published by Second Story Press, entitled “Native American Men of Courage.” He was featured in this book because of his pivotal role during a time where many of his Aleut people on St. Paul Island experienced community-wide depression, suicides and suicide attempts, and murders. On November 18, 2009, Les Intouchables Publishing Company of Montreal released a book that he co-authored, entitled “Aleut Wisdom: Voice of an Aleut Messenger”. The book, published in the French language, is based on the wisdom Merculieff learned from his Aleut people and indigenous elders from around the world. Merculieff works as an independent consultant. Currently he just completed five interactive forums for Alaska Native youth and emerging leaders on what they need to know to survive and thrive in the 21st century. The unprecedented forums were sponsored by the University of Alaska-Anchorage and the Alaska Humanities Forum. Merculieff is also contracted by the College of the Menominee Nation to guide the College in its efforts to help the Menominee Nation develop climate change adaptation strategies, and the Eyak Preservation Council to assist in unifying all the tribes of the Copper River for stewardship of the river. In the Alaska Tribal Leaders Summit held August 24 through 26 of this year, Merculieff facilitated use of traditional ways of dialogue, discourse, decision-making and consensus building throughout the conference. For the first time in memory, leaders from over 100 tribes talked without conflict and reached unanimous decisions on courses of action dealing with the human rights challenges to Alaska Native traditional hunting, fishing and gathering. This entry was posted in Make No Bones Shows and tagged Honoring, Indigenous, KAOS 89.3 FM, Larry Merculieff, Make No Bones About It, Native American Indian, Raven Redbone, Raven speaks with Larry Merculieff of the Seven Generations Consulting, Seven Generations Consulting, Thanks. Bookmark the permalink.